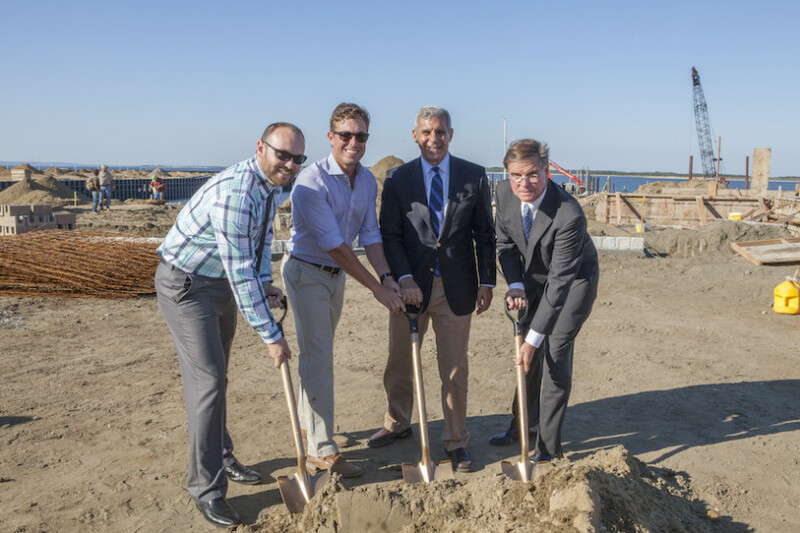 Sandy Hook Bay Marina, a Bollerman Project, announced today the celebration of their Ground Breaking Ceremony for the reconstruction and expansion of the Sandy Hook Bay Marina located at One Willow Street in Highlands, NJ. This redevelopment project represents one of the largest private investment reconstruction projects post Super Storm Sandy and qualified for a grant under the National Boating Infrastructure Grant Program. “It was always our intention to expand and improve the facilities at Sandy Hook Bay Marina, We realized the critical importance of the marina’s location as a safe harbor and the value of the location as a major departure point, particularly for transient boaters” stated James Bollerman, President and CEO of Sandy Hook Developers, LLC; “Now it is our goal to continue on our efforts thwarted by Hurricane Sandy and rebuild a stronger and better marina that will not only offer boaters a state-of-the art marina with an abundance of amenities, but will also have a beneficial economic impact on the Borough of Highlands and the surrounding community”. The marina was part of a master plan for re-development of this 11-acre water front parcel of which approximately 5 ½ acres was sold to Pulte Homes for the construction of 49 townhomes. Upon completion of this $8.5 project the marina will boast a total of 130 new floating dock slips, 15 of which will be reserved for transient boaters, and will accommodate vessels from 25 to 70+ feet in length. Work on the basin which is now complete included the installation of new wave screens, bulkheading and dredging providing a deep-water approach of 8’ at mean low tide, and making this a safe haven for vessels of all sizes. In addition to the many local area attractions that the Historic Highlands has to offer, onsite amenities available to marina members and guests will include a swimming pool, private veranda, ships store, grill area, restrooms w/ showers, laundry, bicycles, shuttle service and an outdoor Captains Bar featuring live entertainment and creative libations. The marina office is now open for business and accepting reservation for the 2016 boating season. For more information call 732-872-1511 or email info@sandyhookbaymarina.com.